Last weekend, I went to my friend’s house for a bit of Rock Band practice. As I was telling my friend’s house mate about how I wanted to name the band “Spice Girls,” he said we should name ourselves “Five Spice Girls.” (五香粉) Each band member can be one of the Five Spices. If we do create a new band next time, I totally want to be Star Anise. Tivo was kind enough to record “A Face to Die For” from Lifetime today. Lifetime is one of my guilty pleasure channel. When I was out of a job back in 2000, I watched a lot of Lifetime. I also raised puppies, but that’s a story for another time. One day, the mister said this to me. “Why do you watch shows about women who are abused by their husbands and end up killing their husbands?” Never noticed the pattern until he said it. Anyway, the Mister is getting really good at guessing the Lifetime movie plots. As we were watching “A Face to Die For,” he started to call out each plot line and twists. He swore to me that he has not seen this movie before. I guess all these years, he has been paying attention after all. 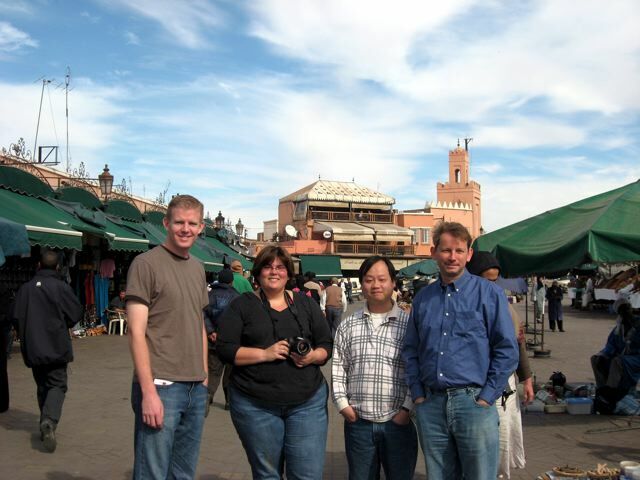 Previously on Euro Trip 2006 part 3, we were in Dijon drinking wine and snacking on most delicious chocolate croissant and sad to be leaving to go on our last destination Morocco. By this time, some of the party member are getting tired of each other. We have spent time none stop with each other for a week now. And I was kind of starting to miss the Mister. 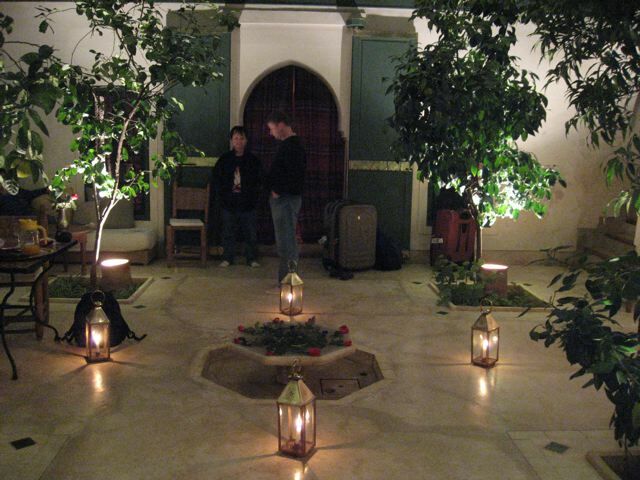 Anyway, we arrived in Morocco in the dead of night. The Mister was waiting for us at the airport. 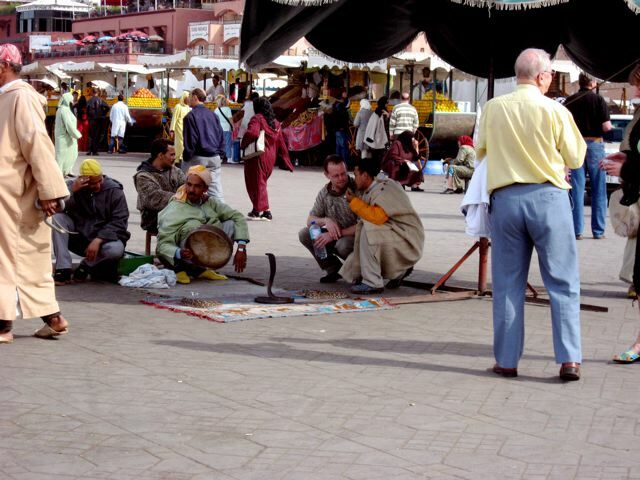 We got in this van and he drove us to the Medina, and well, it was kind of scary. He took us down to this long narrow alley way and I was not quite sure what to expect. 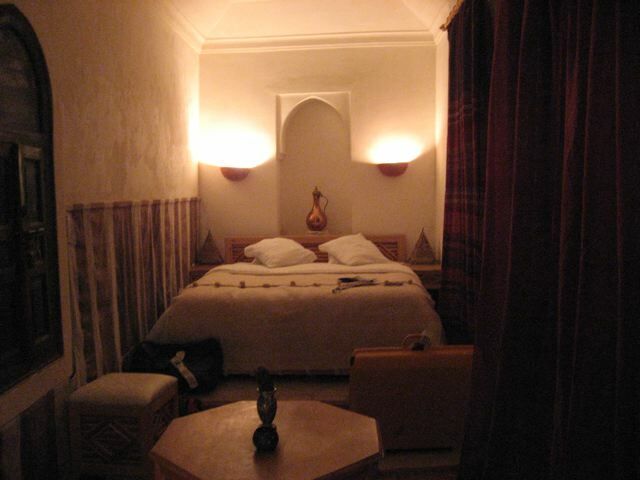 We booked this Riad sight on seen. 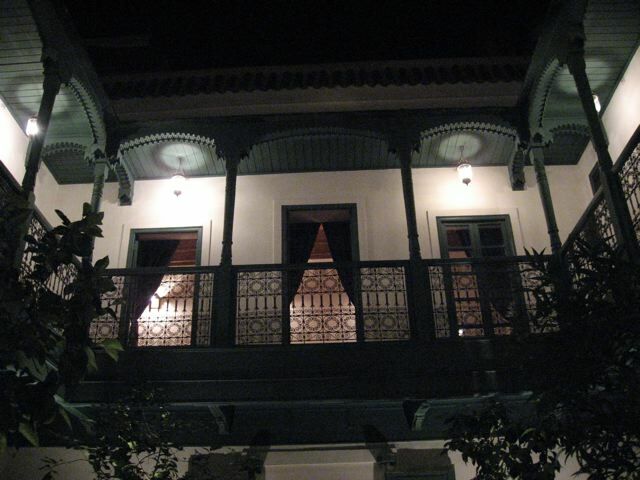 But we were pleasantly surprised when we saw the riad. It was gorgeous. The housekeeper had refreshment for us. The place was gorgeous. It had a open roof! We ran around taking pictures. We were all pretty tired. But the next day, we got up and start to explorer around the house. We found sound outdoor showers on the top floor! 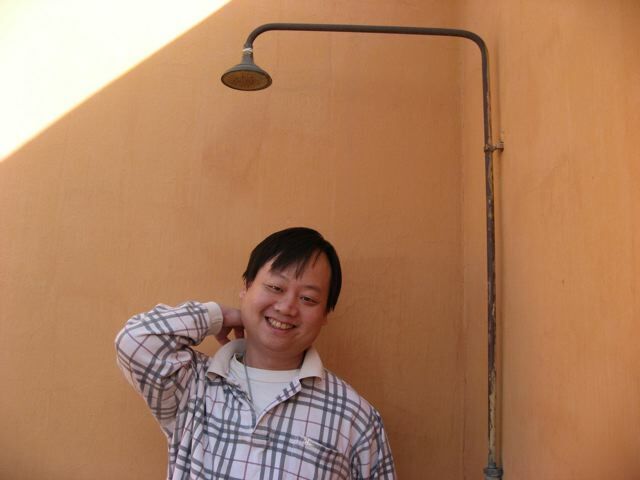 And naturally, we have to take picture of Joe taking an ‘air shower’. We saw lots of interesting things on the way to the square. 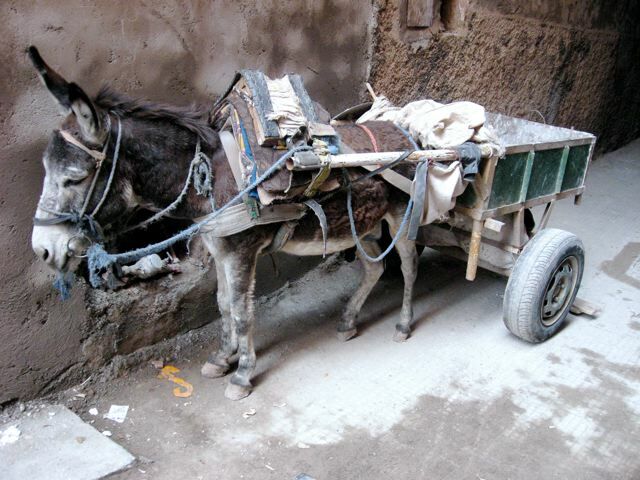 I have more to say about Morocco but I am getting quite tired. I’ll pick this up some other time! 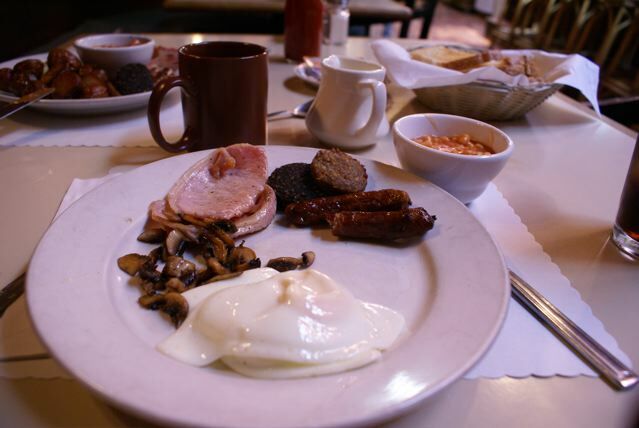 Over the weekend, we went on a search for a good Irish Breakfast. We found this really nice place (on the internet of course!) in Haight-Ashbury, called Martin Mack’s. We were going to get up at 9:00am and drive into the city for a bit of breakfast. But we didn’t get up until 10:00am. We were a bit worried by the time we got there they would stop serving breakfast. We end up getting there around noon (spent30 min trying to find parking!!) saw the sign, branch from 10:00am to 3:00pm! YAY! Here’s a picture of my delicious breakfast. I was so excited at the thought of having black pudding, I took a bit of the sausage before I had a chance to take a photo. The breakfast comes with potatoes (of course) but I opted in for mushrooms. The sausages weren’t the best, but the black and white pudding was delicious. I definitely would go back again. As we were planning to go to breakfast, we decided to do a mini road trip to check out some interesting graves in SF area. 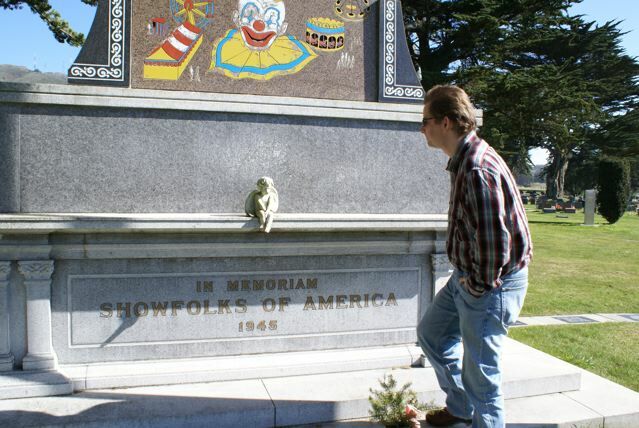 We end up visiting a grave for clowns. 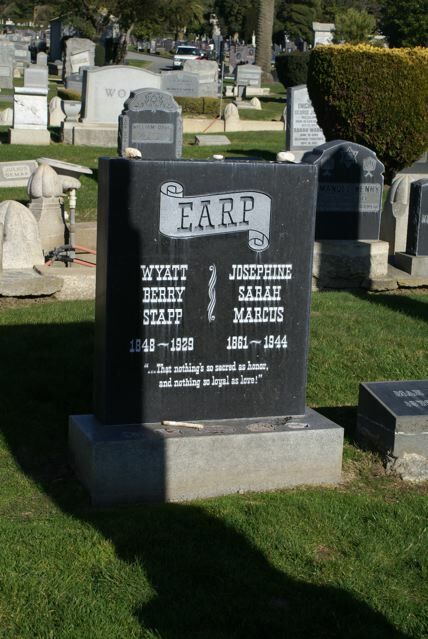 But the highlight of this trip was seeing Wyatt Earp’s grave. Personally I hate westerns. But couldn’t resist this one. It’s Wyatt Earp, even if you hate westerns you would know who he is. Anyway, he’s buried in a Jewish cemetery in Colma. Every site we visited just said where he is at but never gave an location of where he is in the cemetery. We drove around the cemetery seem like for ages trying to find him. Thanks to my trusty Blackberry, I found a blog that had the exact location. He is in plot D, section 2, lot 12, grave 2. Walk up to the main road from the office and pass the rotary, it is down the sixth pathway on the right. When you see the mausoleum for C. Meyer this is the turn you take. Go down this path past the intersecting sidewalk. It will be on your left in this lot, in the third row back. He’s at the Hills of Eternity Memorial Park. The address is 1301 El Camino Real, Colma. I always assumed that he would be somewhere in Arizona or Nevada. According to some of the site I ready, he’s at a Jewish cemetery because his wife is Jewish. He did this so he can be with his wife and his wife can be with her family. The grave site itself is not exciting. Mr. read somewhere that the original one was stolen. People put poker chips and money on his grave. I never knew Earp was such a gambler. Levi Strauss is suppose to be in the same cemetery, but I was pretty tired by then so we decided to just head home. Over all a pretty fun day!